Book Classified Advertisements at discounted rates in Dainik Bhaskar Newspaper through Ads2publish.com, a leading Dainik Bhaskar Advertisement Agency in Udaipur. We are Dainik Bhaskar Advertisement Agents helping you to book ads in Dainik Bhaskar Newspaper at lowest rates and best service. We have an advertisement booking centre in Udaipur which facilitates us to book classified advertisement for Dainik Bhaskar. At our online booking centre we don't charge anything extra from our customers for publishing their ad in Dainik Bhaskar. Infact, the advertisement offers and packages for Dainik Bhaskar Udaipur Newspaper have been effectively showcased so that you don't miss the opportunity to save money and get the best response from your advertisement in Dainik Bhaskar. A leading Dainik Bhaskar Advertisement Agency with great customer support team which will make ensures that you don't face any problem while booking your ad or tracking in the newspaper. You can contact us via Live Chat, Call us or Email Us. Ads2publish is a product of Bhaves Advertisers, an authorized advertising agency of Dainik Bhaskar serving clients to book ads for Udaipur edition. Being a leading Ad Agency of Dainik Bhaskar, we publish your ad at the same cost or even lesser than the tariff rates using our online booking service. Dainik Bhaskar is an Hindi Language Indian Newspapers. It was founded in 1958 in Bhopal, Madhya Pradesh. Today it is the largest daily newspaper in India having presence in 12 states and 40 editions which also made Dainik Bhaskar world's 4th largest circulated daily newspaper in 2013-14. Dainik Bhaskar has 5 editions in Madhya Pradesh, 4 editions in Chattisgarh, 12 editions in Rajasthan, 3 editions in Haryana, 4 editions in Punjab, 7 editions in Bihar and Jharkhand and 1 edition each in Chandigarh, Himachal Pradesh, Uttarakhand, Jammu and Kashmir and New Delhi. Book your classified ads in Dainik Bhaskar Newspaper. 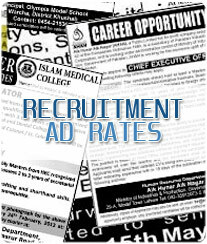 It offers various advertising options in the newspaper. Classifieds Column in Dainik Bhaskar publishes every day in the Newspaper but the response are more for Matrimonial Ads on Sunday, Property, Rental Ads on Saturday and Sunday, Recruitment and Name Change Ads on all days. Dainik Bhaskar is a leading Newspaper in Udaipur City. It has good circulation and reach as compared to other leading newspapers in Udaipur centre. Advertising in Dainik Bhaskar paper gives you good response and you can reach your targeted readers effectively at low cost. People who has advertise in Dainik Bhaskar Udaipur Classifieds has given Average 4.5 Star rating for the response they recieved. 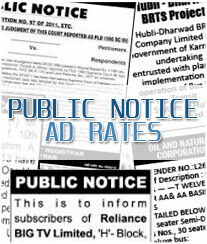 Select the Advertisement category from the above list to advertise in Dainik Bhaskar Udaipur classifieds column. Compose your ad taking help of Dainik Bhaskar Classified Sample Ads so that you can convey advertisement effectively to your targeted audience in Udaipur. On successful payment, immediately you will receive an auto generated invoice from our system confirming your Classified Ad booking to your registered email id. Then post editorial approval of your advertisement from Dainik Bhaskar newspaper your ad would be published on the chosen dates. Our Customer Support team is available from 10:00am to 7:00pm but you can book your ad 24x7 online. 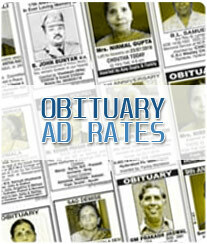 You can book your ad at your convenience. 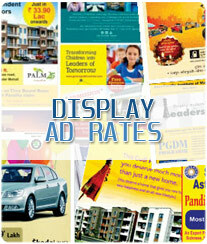 You can even call our Dainik Bhaskar Advertising Department at +91-8121003003 for any help required. How are price charged for advertising in Udaipur Edition of Dainik Bhaskar? 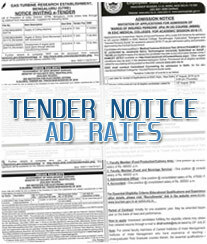 Classified Advertisements in Dainik Bhaskar are accepted in two formats. One is Classified Text Ad and the other one is Classified Display Ad. Both are charged differently because of the difference in their format and placement in Udaipur Newspaper. Classified Text Ads in Dainik Bhaskar are formated in simple running text. They are charged based on the number of Line or words used in the advertisement content. To enhance your Classified text ad you can use enhancements options like Background Color, Bold, Tickmark for higher visibility by paying some extra cost. Classified Display Ads for Dainik Bhaskar can be design according to your own choice of font, images and logos. 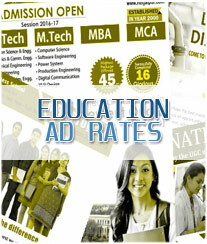 Classified Display Ad are charged per square centimeter in Dainik Bhaskar Newspaper. But their is restriction for minimum and maximum Height and Width to be taken. 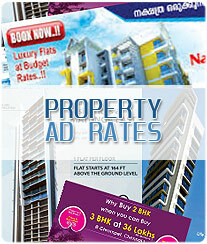 You can choose B/w or Colour advertisement as cost of advertisement may vary for B/w and Colour. If you are not looking for Udaipur Edition of Dainik Bhaskar Newspaper then choose from the following categories to shift to other city: Matrimonial, Recruitments, Property For Sale, Property To Rent, Name Change, Lost Found, Astrology, Business, Education, Services, to book your classified ad.